The Buddhist origins of the Ullambana Festival can be traced back to a story that originally came from India. In the Ullambana Sutra , we find an account of how the Buddha taught Mahāmaudgalyāyana help his mother who was suffering in the lower realm of the Hungry Ghosts. Mahāmaudgalyāyana was a well-to-do merchant who had given up his trade to become one of the Buddha's chief disciples. After he attained arhatship , he thought of his parents and wondered what happened to them. He travelled over the known Buddhist universe, and found his father in heaven. However, his mother was reborn in a lower realm, known as the Realm of Hungry Ghosts. His mother had taken on the form of a hungry ghost. It could not eat because its throat was very thin and no food could pass through, yet it was always hungry because it had a fat belly. His mother had become greedy with the money he had left her. He had instructed her to kindly offer dana to any Buddhist monks that ever came her way, but instead she withheld her kindness and her money. It was for this reason she was reborn in the Realm of Hungry Ghosts. The Buddha instructed Mahāmaudgalyāyana to make offerings of Pravarana food to the virtuous assembly of the Sangha on the last day of the rainy-season (summer) retreat (fifteenth day of the seventh month in the lunar calendar). The merit gained from the dana liberated Mahāmaudgalyāyana's mother from hell. 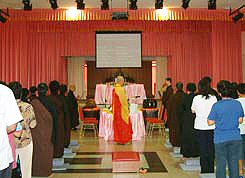 Today, the exact same ritual that the Buddha asked for Mahāmaudgalyāyana to do is well practiced in many parts of Asia. In Than Hsiang Temple, this Ullambana Festival is celebrated with six continuous evenings of chanting of Amitabha Sutra and on the seventh day, a Filial Piety Dharma Assembly is held together with a Lamp Lighting Ceremony. 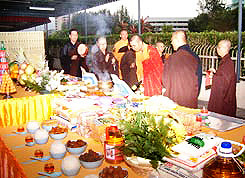 The purpose for having a Filial Piety Dharma Assembly is to develop gratitude for our parents, ancestors and all sentient beings, who could have been our parents in our past uncountable lifetimes, and to transfer merits to the departed ancestors, relatives and all sentient beings in all the Buddhist realms.